I’ve known Gareth for years, and always wanted to do a mini doc on him. This is a short glimpse into who he is and some of the work that he does, maybe one day we can collab on a documentary. A childhood friend asked me to make a video for their wedding. Of course, I couldn’t say no! This video was shot and edited in 1 day. The song of choice is “High Beams” by All the luck in the world. When I heard this song I felt like it perfectly embodied the adventurous spirits of Sana and Yaser. The song is about turning your high beams down, and taking corners that are there for us to take them one at a time. This is such a powerful lesson that we should all work to incorporate into life. Appreciate and cherish and be grateful for the now, and never say no to a corner that is calling your name. Rayhan is a special girl…she is the daughter of one of my closest childhood friends. They didn’t necessarily ask for this video, but I am so happy I am able to give this to them as a way to remember this day. Humble Beginnings is a non profit that specializes in social work in the Paterson, NJ area. They asked me for a same day shoot/edit documenting their pre-thanksgiving event for social media. It was shot and edited in the same day and uploaded to Facebook and Instagram. I met Khalid Sabree through social media, and after seeing his work, I HAD to make a mini doc about him. Shot on a 5D Mark IV in CLOG with a Sigma 35mm f1.4 Art lens. I was asked by the Islamic Center of Passaic County to produce a short video introducing their new youth development manager, Yousef Bakeer, to their community. After a call with Yousef, I wrote the script, then met up with Yousef to record it. The entire process took less than one day. Yousef has a great outlook on life and is full of energy, I can’t wait to see the good things he will accomplish. This video was inspired by an article that Imam Zaid Shakir published in January of 2018, called "This is Who We Are." I was so moved by the piece that I decided to make a video about it. I took the original script and molded it into a video friendly one, then contacted Gareth Bryant, who also loved the script, and asked him to narrate the piece. 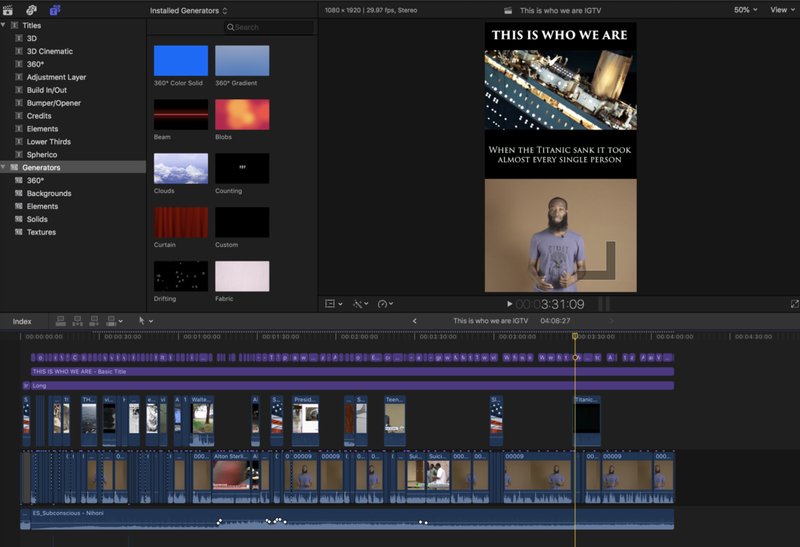 The tricky part today is in the editing room, where we now have to cut videos for Youtube (1920x1080), Facebook (Square, or sometimes a little taller), and Instagram TV (1080x1920, a vertical video). There is no easy way of creating one edit then exporting once for each platform, each platform requires it's own specific edit. This isn't an issue for me because I love video editing so much, but for others it can be a hassle. UPDATE: CROWDFUNDING GOAL HAS BEEN REACHED! WHOO! Shot on Canon 5D Mark IV paired with Canon 16-35 f4 lens. Here are all the videos from #BlackMuslimsSpeak Season 1. Our struggles are one and it's going to take all of us working together, across communities, to overcome the fear and divisiveness that we're facing right now. That's why, last Thursday, we brought together New Yorkers of various faiths and backgrounds to break bread and build solidarity in a public iftar dinner, held outside of Trump Tower. We held the event as a rebuke of the Trump administration's anti-Muslim White Nationalist agenda, but more importantly—we held it to renew our commitment to being connected to one another. We were honored to be joined by New Yorkers of many different backgrounds, to show that even in the face of hate, we stand strong in defense of our values of unity, compassion, and love. A film I made for a dear friend, Brother Akbar Mcentyre. Akbar started a nonprofit named "Humble Beginnings", that aims to better Paterson New Jersey through social work. Brother Akbar is an inspiration. He is a selfless human who loves his community and works harder than anyone I know. He uses his personal van to help distribute food very Sunday to people less fortunate in Paterson, New Jersey. This video was part of the "Power Up" campaign, which raised money for a generator for Gaza's first startup incubator: Gaza Sky Geeks. Every startup founder and developer should have access to electricity and the internet. But in Gaza, a severe energy shortage means we only get 1-6 hours of electricity from the grid. We urgently need electricity so that our companies can succeed. Empower us to fuel our own futures: contribute at PowerUpGazaGeeks.com. Gaza is one of the toughest environments in the world, with the highest measured rate of unemployment. Because the borders are closed, most industries cannot thrive. We harness the power of the internet to build companies that target external markets, creating jobs and unlocking opportunity for talented youth. Leaders from Silicon Valley, the Middle East, Europe, and the global tech sector have joined to support Gaza's geeks. Thank you for donating to our crowdfunding campaign and spreading the word! I edited this video in Adobe Premiere Pro and also helped shoot it and write the script. - All lives don't matter until black lives matter. If you know someone who says or thinks "All lives matter" go talk some sense into them. This is important! - The protest seemed unorganized and was lacking a leader. When the cops showed up, everyone was on their own. Leading a protest is hard. - We marched in the streets and were met with a blockage of cops wearing battle ready gear. Marching towards them made the term "police state" seem that much more real. - The cops ran towards us and started hitting people with batons in an effort to get people on the sidewalk. This in turn made some people scared, and then they fought back, they were arrested. - There were almost as many cops as protesters...it was ridiculous. Helicopters, armed cops...the only thing that was missing were tanks. In 2013, with the help of my good friend Atif Mahmud, we produced UnMosqued, a documentary film about the relevance of mosques in America. The film was fully funded on Kickstarter in 10 days, was covered by multiple news outlets, and had 50+ screenings all over America. The film was thought of, planned, filmed, edited, and distributed in 2013. Here are some clips from the film. For more information, please visit the official website for the film, here.